More lettuce simply means that we are still having a salad with every meal. I look at it this way: we can happily get our fill now and then come winter, when the lettuce from the supermarket is tasteless and expensive, we can do without; such is how it goes when you are eating in season. And I have to specifically mention the cherry tomatoes: sweet and absolutely delicious - the way tomatoes are supposed to taste. The same can be said for the carrots as well. Cabbage Salad - recipe courtesy of last year's produce box. This salad is delicious and has become a family favorite. As soon as I opened our box this week and saw what was inside, I got to making this salad (using the cabbage, onion, and broccoli). Balsamic Honey Roasted Cabbage Steaks - recipe courtesy of Eat Well 101. I found this recipe ages ago and kept it tucked away for when I had some cabbage on hand. It was delicious. I served the 'cabbage steaks' with roasted broccoli leaves which I have mentioned here before. We grew broccoli in our garden this year and, having already harvested the crowns, we are now eating the large leaves roasted in the oven with garlic, sesame oil and soy sauce...yummy. 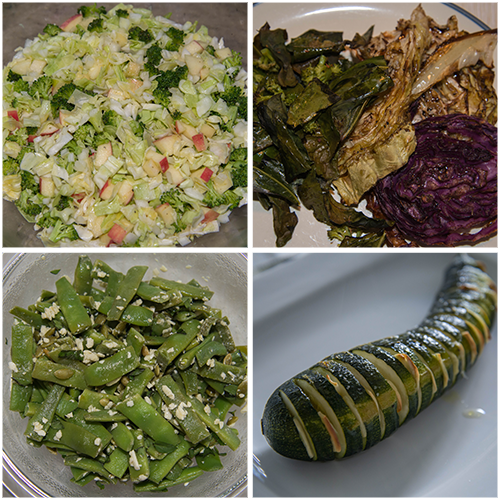 Green Bean Salad - recipe adapted from The Forest Feast (she used purple beans, I used green). A delicious and simple salad - the pumpkin seeds and feta were a tasty touch. Accordion Zucchini - I have wanted to try this for a long time. Not surprising, the recipe is from The Forest Feast and is so tasty. 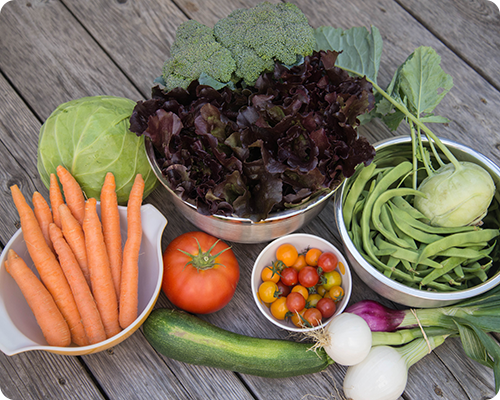 As I work with all this fresh produce every week, in addition to the veggies that I am harvesting from our garden, I feel my confidence in the kitchen growing. Not that I was ever uncertain of myself as a cook (goodness knows I have had a lot of practice) but I now feel much more aware of what to do with certain produce, I have a greater arsenal of recipes to pull from, and I feel more and more adventurous to try something new. Having all this local produce on hand and cooking from it is an incredible learning experience for me and one that I am really enjoying. Thank you Irune. It is a lot of fun to cook with fresh produce every week...I am really enjoying myself. Healthy dinner ideas, thanks so much! Thank you...healthy food is my favorite.